Wood burning fireplaces can be classified into two types: Ambient and High Efficient. Whichever type you are looking for, you can be assured that we have the stoves and fireplaces along with the expertise to complete the installation. SBI, manufacturer of the Osburn brand, is a Canadian family-owned enterprise dedicated to the design, manufacturing, and marketing of residential heating appliances sold around the world. The Supreme Plus delivers more than just a beautiful fire. This fireplace was designed for the homeowner interested in heating large areas of their home. 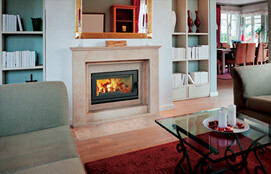 The Supreme Plus is recognized as one of the most efficient EPA fireplaces in the industry.